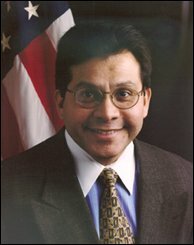 Alberto Gonzales (1955- ) is an American jurist and politician who served as a judge on the State Supreme Court of Texas (1999-2000), White House Counsel (2001-2005) and the U.S. Attorney General (2005-2007). He was appointed Attorney General by President George W. Bush in 2005 to replace John Ashcroft, becoming the first Hispanic to serve this post in the United States history. However, Gonzales was pressured to resign from this post in 2007 due to his involvement in the U.S. Attorneys dismissal scandal. This page was last modified 18:13, 5 May 2008.